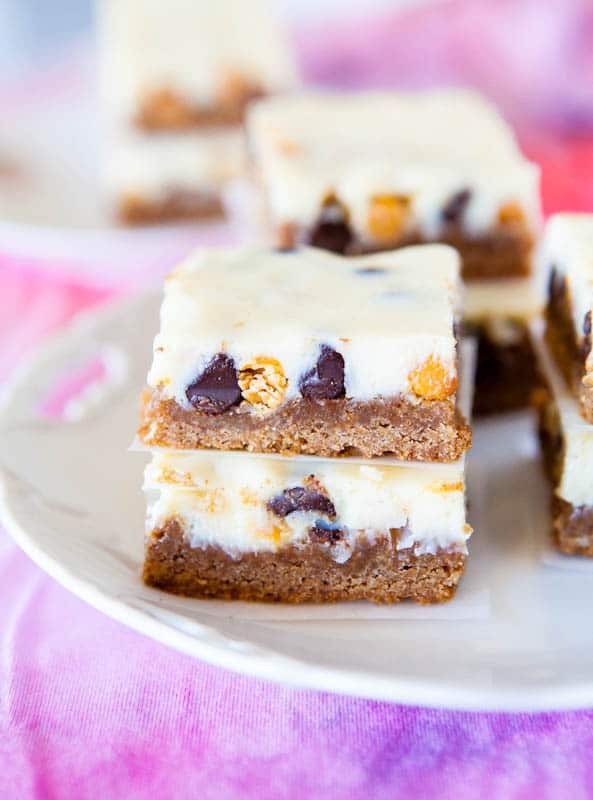 I haven’t made cheesecake bars in over a year. I’m so glad I remedied that with these. 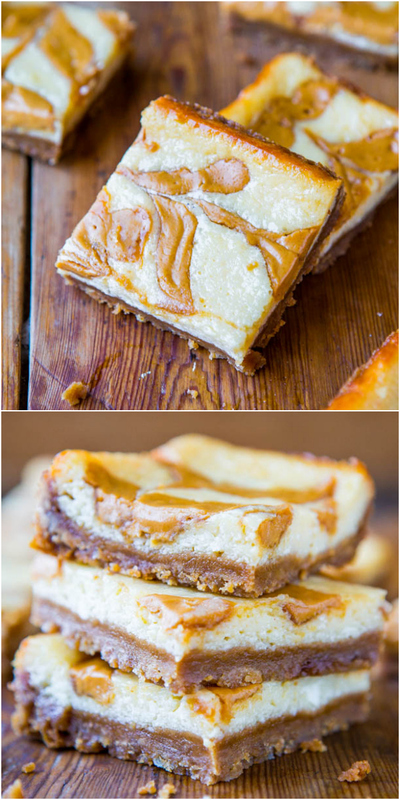 They combine so many of my favorite dessert elements in one including a buttery, brown sugar and graham cracker crust. 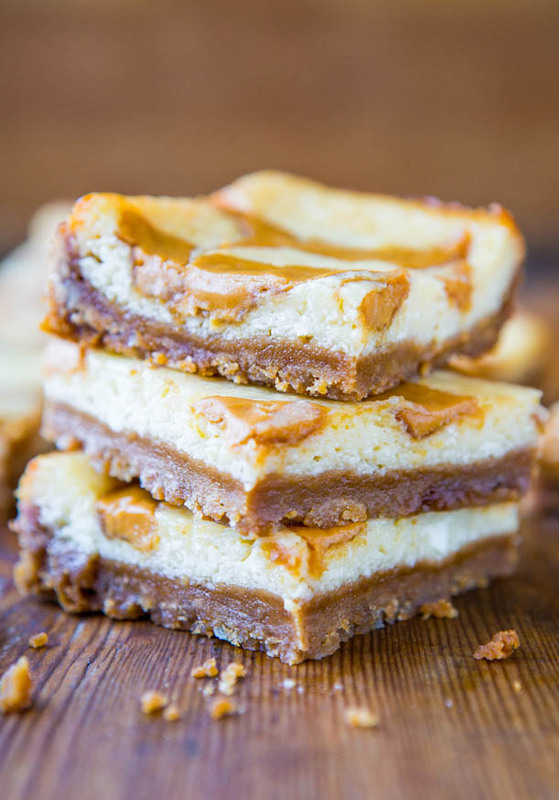 I adore graham cracker crusts, and it truly makes these bars. I used a trick for the crust that I discovered when I made The Best Lemon Bars and also used in the Peanut Butter Caramel Twix Bars, which is adding a tablespoon of cornstarch to the crust. I think it prevents the crust from getting overly brittle or being prone to cracking or crumbling. I use cornstarch all the time in cookies because I prefer softer to snappy. This crust is definitely crunchy, but it didn’t crumble or fall apart, which I find is often the case with graham cracker crusts. For the filling I got away with using light cream cheese. It’s a little counterproductive to use light cream cheese right along with a stick of butter and gobs of peanut butter, but hey, at least the recipe has been tested with light cream cheese and it works. Using light cream cheese can be a gamble, but you’re safe here. Feel free to use full-fat if you prefer extra cardio. 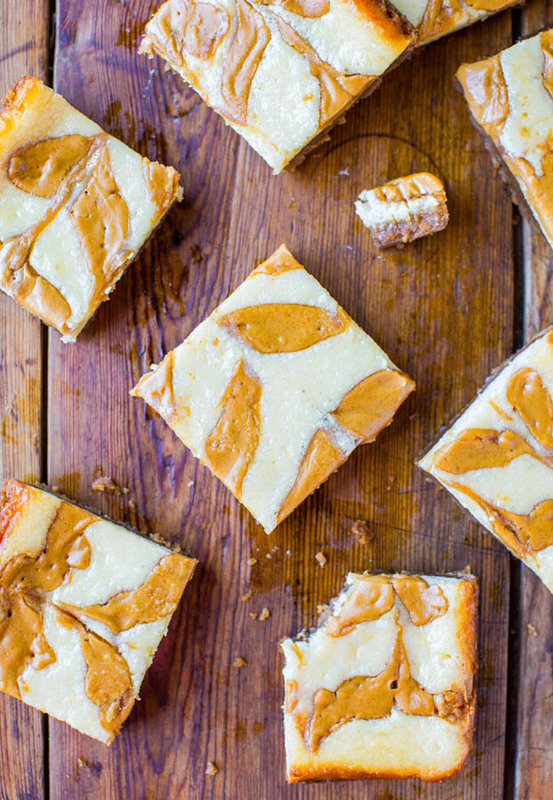 Everything is better with peanut butter swirls, from cake to brownies to cheesecake. If you’re a cheesecake purist, you can omit the swirls, but I like the break up the visual monotony with swirls and of course, they taste so good. 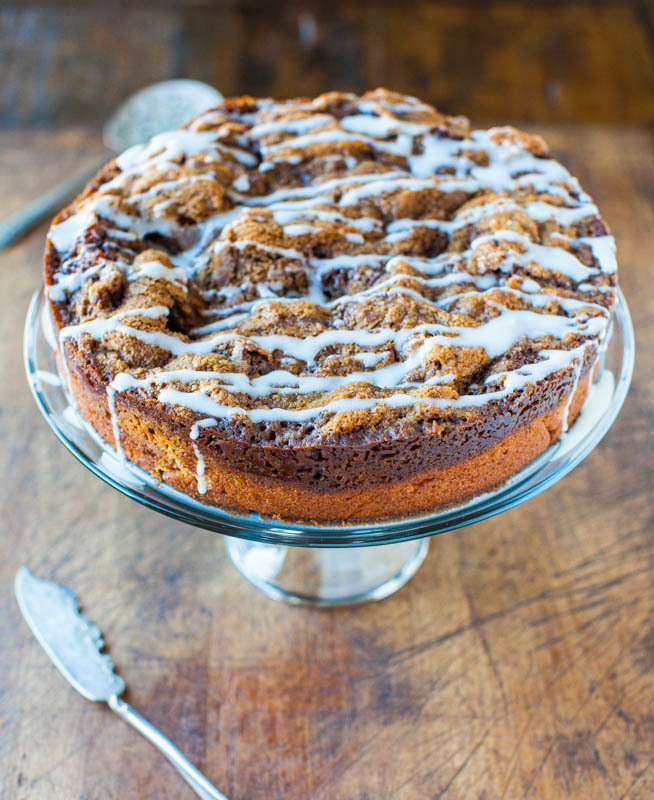 Or use your favorite jam or Nutella swirls. 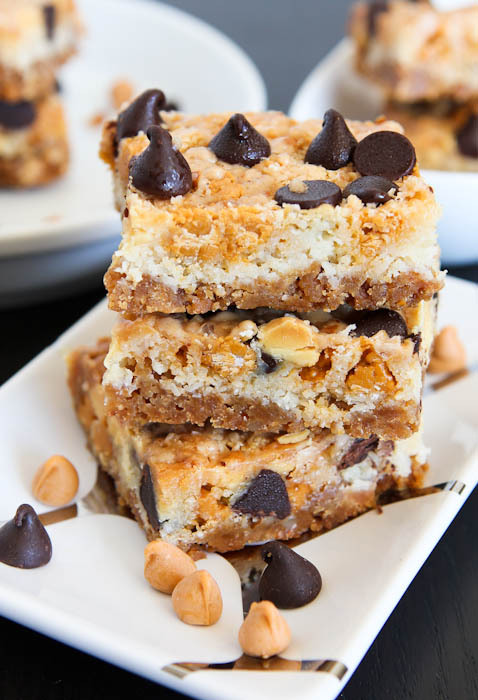 The beauty of these bars is that they can be made in one bowl, and there’s no need to wash it between the layers, which isn’t often the case with layered bars and there’s umpteen dirty bowls for one pan of bars. Nor do you have to drag out a mixer, another time-saver. Not having to mess around with making a real cheesecake, baking it in a water bath, or dealing with possible cracks, is even better. I just can’t be bothered with all that. The bars are fast and easy, just the way I like my desserts. They’re also rich, decadent, and comforting. The graham cracker crust adds texture and crunch, a wonderful counterbalance to the smooth, dense, cheesecake layer. 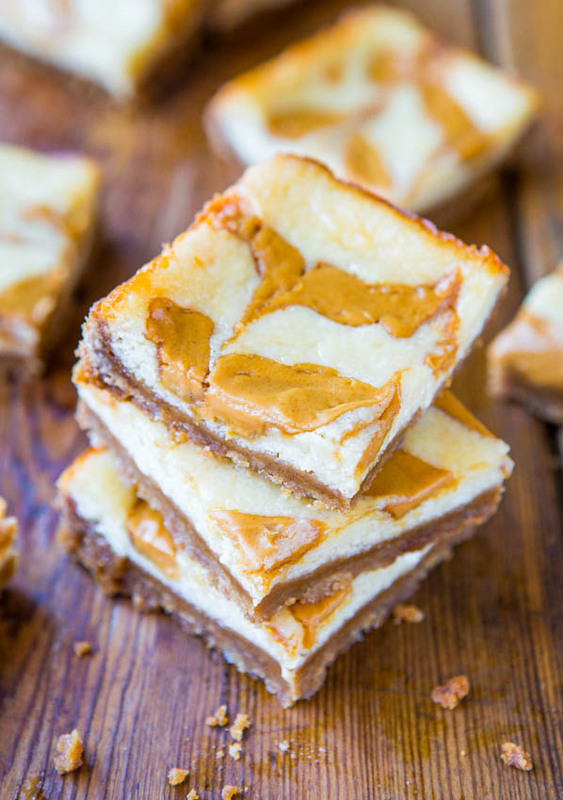 The cream cheese is tangy, the peanut butter is a tiny bit salty, and the crust is so buttery, with notes of caramel from the brown sugar that caramelizes while baking. 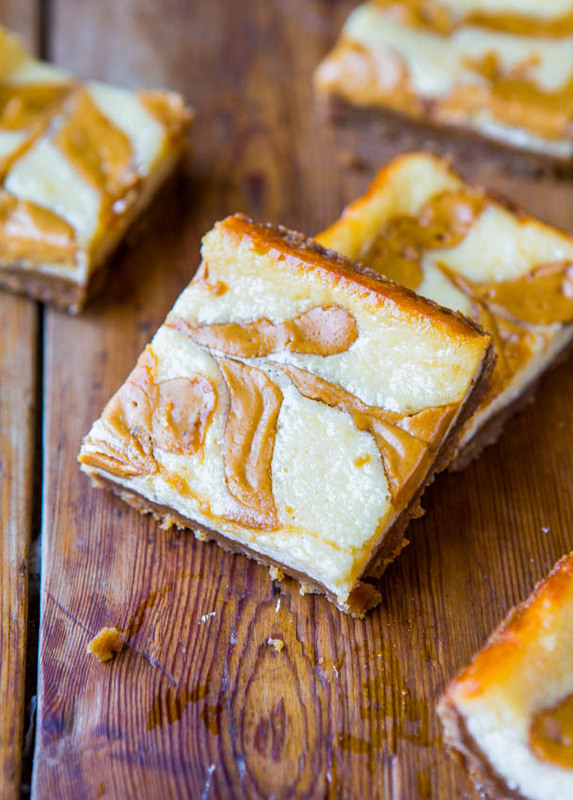 I won’t wait another year-plus before making more cheesecake bars after indulging in these. Dense, rich, and indulgent, these fast and easy bars come together in one bowl, without dragging out your mixer. 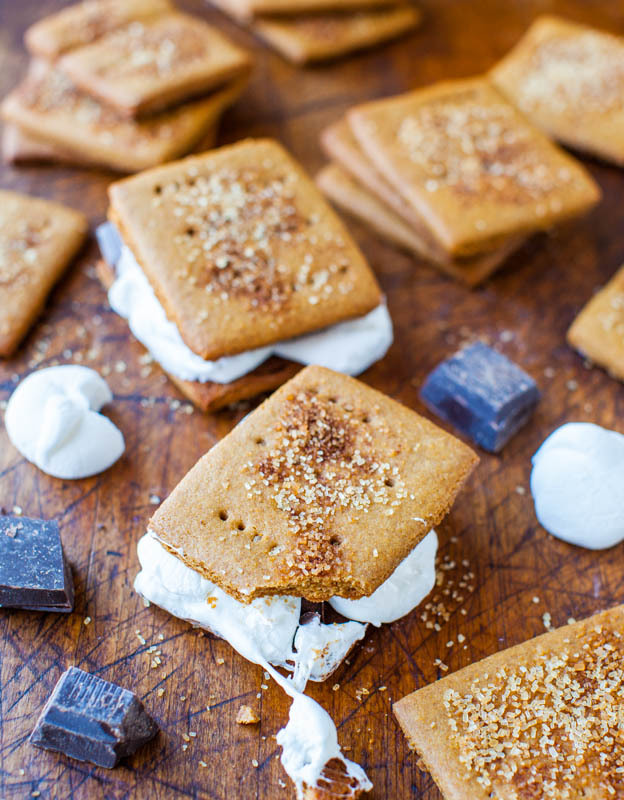 They’re rich, satisfying, and full of tangy flavor from the cream cheese. 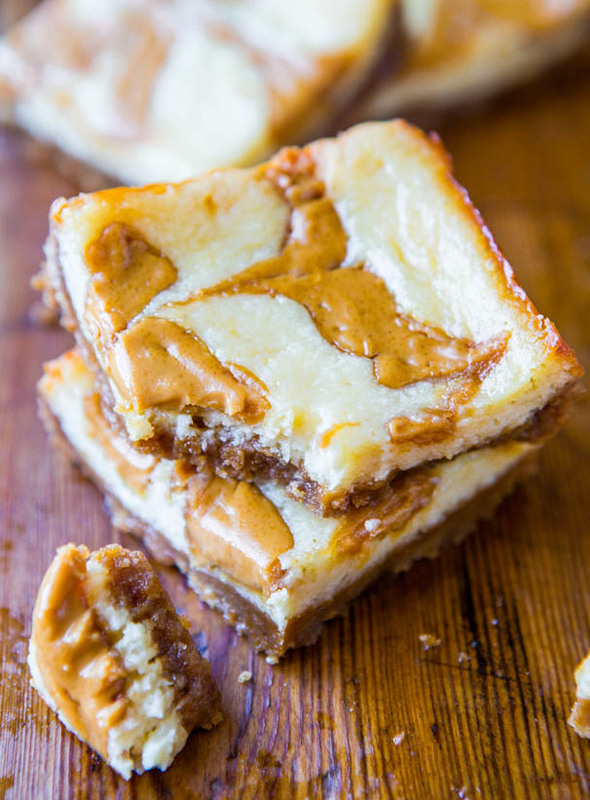 The peanut butter swirls add a touch of saltiness, while the very buttery, brown sugar and graham cracker crumb crust lends texture with notes of caramel flavor. 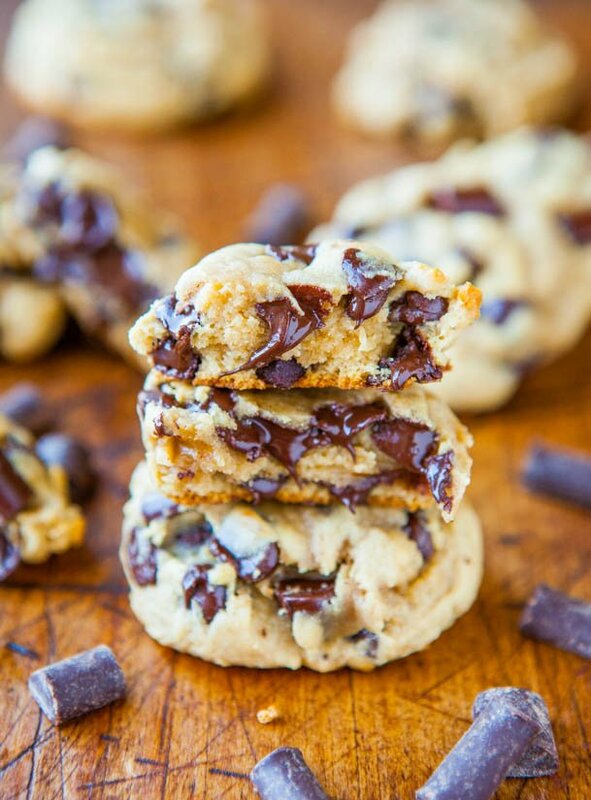 The crust is so packed with flavor and texture, and just makes the bars. All the flavor of cheesecake, with none of the fussiness or work. Preheat over to 350F. Line an 8×8-inch pan with aluminum foil, spray with cooking spray; set aside. 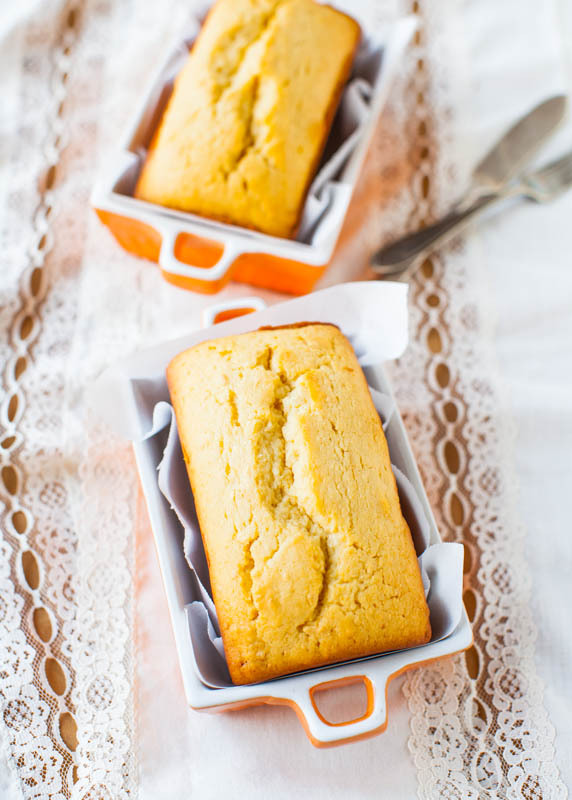 In a medium microwave-safe bowl, melt the butter, about 1 minute on high power. Add all remaining crust ingredients and mix with a fork to combine. Turn loose crumbs out into prepared pan and using a spatula, pack mixture firmly into pan in an even, smooth, flat layer; set pan aside. In the same mixing bowl (no need to wash it), combine all filling ingredients except peanut butter, and whisk until smooth and combined, or beat with an electric mixer if preferred. The softer the cream cheese is, the easier the filling comes together. Pour filling over crust; set pan aside. In the same mixing bowl (no need to wash it), melt the peanut butter, about 1 minute on high power. Drizzle peanut butter over batter to create swirls. 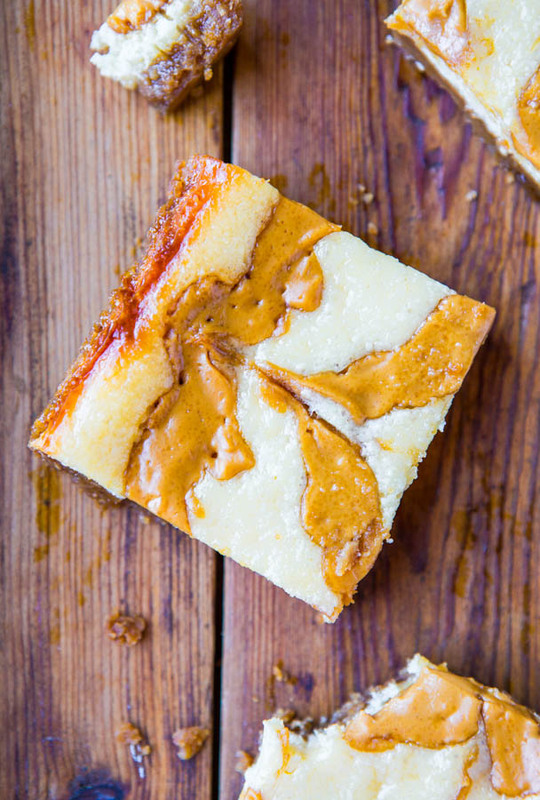 To create the marbled pattern shown, drizzle peanut butter over batter in 5 wide, evenly spaced, parallel lines, each spanning the length of the pan. Like 5 rows of long train tracks. Rotate pan 90-degrees. With a toothpick, starting at the top of the pan, “draw” 5 evenly spaced lines through the peanut butter. You’re dragging the toothpick perpendicularly through the first set of lines to create the marbling. Bake for about 35 minutes, or until center is set with very little jiggle; some looseness and a very slight jiggle is okay, but there should be not sloshing in the center. A toothpick inserted in the center should come out mostly clean, or with a few moist crumbs, but no batter. Allow bars to cool in pan for about 1 hour before lifting out with foil overhang and slicing; however, I prefer to serve these bars chilled. Cover the pan with foil to prevent fridge smells, and refrigerate mostly cooled bars for at least 2 hours, or overnight or until bars have chilled completely, before slicing and serving. Bars will keep airtight in the refrigerator for up to 1 week. I prefer to store them in the fridge and serve them slightly chilled. 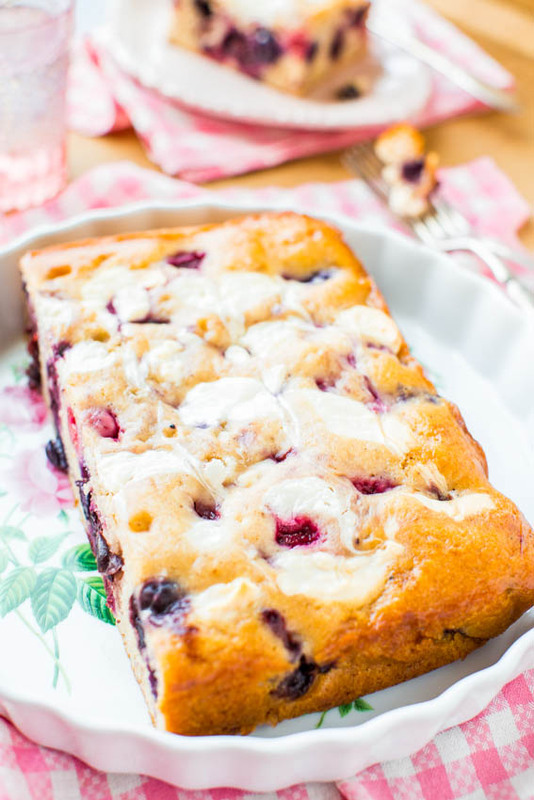 What’s your favorite cream cheese or cheesecake recipe? Made these last night, and they were AMAZING! Husband and I ate them straight outta the pan when they came out of the oven, so our burnt mouths thank you :) I think I might double the cheesecake next time, to cut the sweetness of that crust. But we’re definitely making this again! These look incredibly tasty. I also need to check out those coconut spice bars! 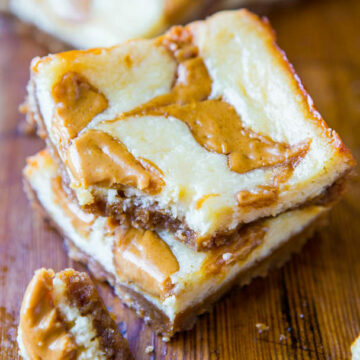 Cheesecake and peanut butter! These look glorious! These look lovely. I’m definitely trying my next graham cracker crust with brown sugar. Why haven’t I done this yet? These sound awesome! Thanks for trying these, Avi! Glad you loved them and they’re easy, yes indeed! Oh my! 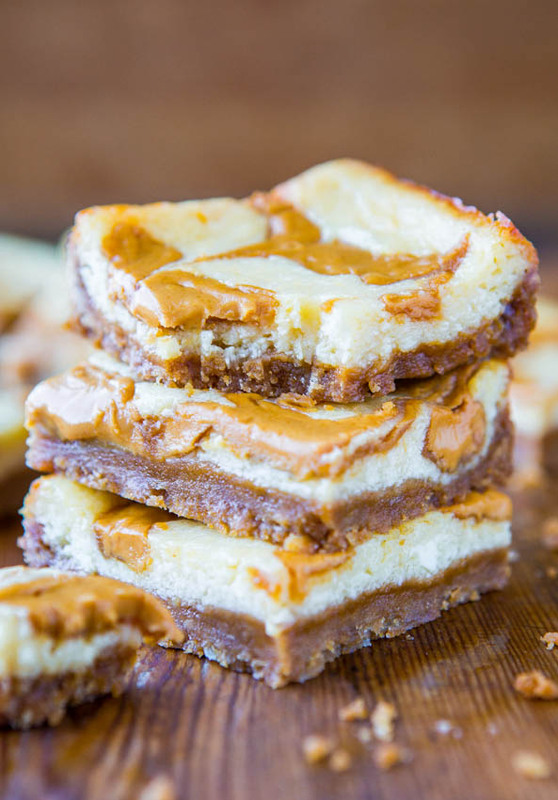 I’m so glad you made these :) they look so incredible and I just adore anything peanut butter! Me too! And even after writing a cookbook about it, I still adore it. Even more so! They look good. But is there anything to substitute for the cream cheese? I can’t stand cream cheese! It’s impossible to make cheesecake as most people know it without cream cheese. You could substitute a Neufantel type of soft cheese but this would require being a fairly good cook and knowing when and where to alter other ratios, like butter, sugar, flour, and baking time. Thanks! They looked so good so I had to ask. Thanks for LMK you were the winner! I just sent your address to my publisher and had no idea who you ‘were’ – thanks for stopping by and saying hi! And this cheesecake is so good – wish I had put it in my cookbook! Totally deserves to have been in the book but I didn’t get the idea til just recently :) Keep in touch and LMK if you make this or what you make from my book! Yum! I made these yesterday and ate them today. 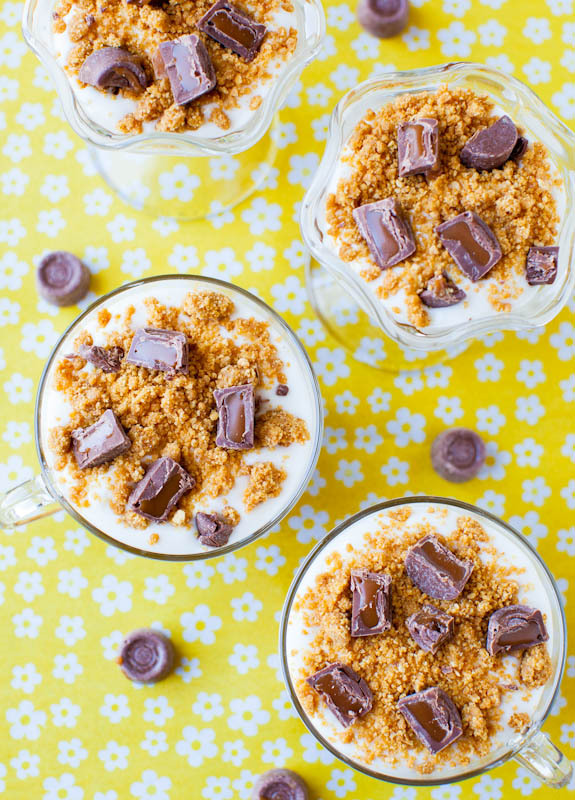 So simple, but so full of peanut butter and dairy deliciousness! I also love how you use the same bowl three times and assure us that we don’t need to bother washing it. Seriously. It’s wonderful. Wow how creative that you drained yogurt! And yes, I am sure it’s probably better with c.c. but you get major points for being creative! Glad you like the same bowl without washing trick. A nice time-saver :) Thanks for trying the recipe! And thank you for replying to my comment. I know you get lots of comments, and it’s amazing that you’re willing to take the time to reply to all of them! I made these yesterday, they were sinful. The whole plate is now gone and my belly is super happy :-) Thanks for a great recipe! So happy to hear you have a happy belly :) Thanks for trying them & glad you loved them! I think I found my new favorite dessert! These were fantastic! Thanks for trying the recipe, Terri, and glad you love it! 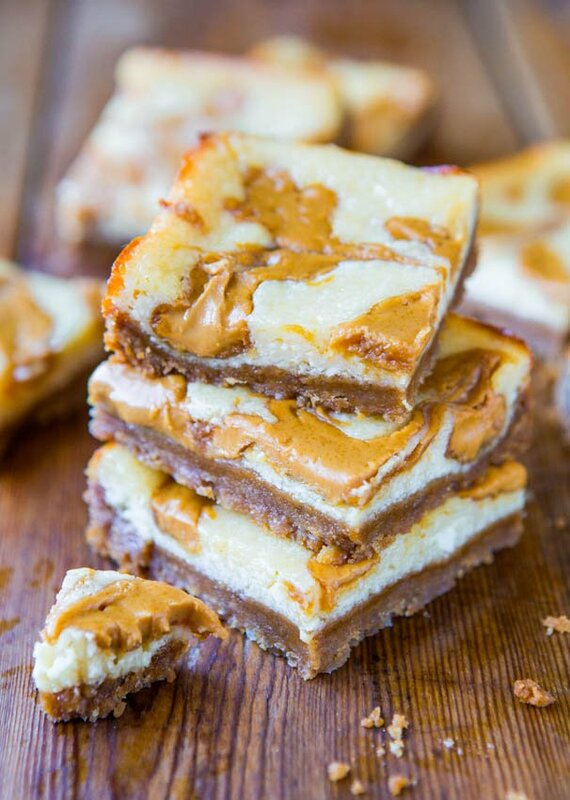 My friends and family, when coming over to my place, usually ask “You got any of your Nanaimo Bars in the freezer?” I’ve made your Peanut Butter Swirl Cheesecake bars 3 times now and it’s gone over very well. Now they still ask for Nanaimo Bars but also if I have any of the “Peanut Butter Cheesecake Thingies”. LOL I have tweaked the recipes somewhat as I found the crust way too sweet so last time I used 2/3 c brown sugar as per your suggestion. Also, the last time I made the recipe I only had Xtra Chunky Peanut Butter on hand. My eldest son said he really liked the chopped peanuts in them and asked to have them made that way next time. 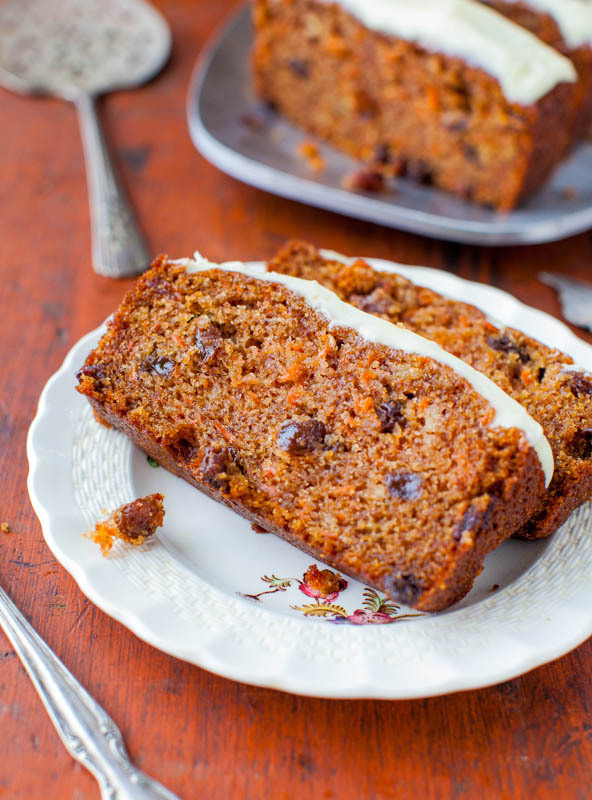 Thanks again for your recipe ….. it’s a keeper. Thanks for trying the “Peanut Butter Cheesecake Thingies” so many times and I’m glad it’s a bit hit with everyone! This crust is pretty darn sweet, you’re right. Glad you were able to tweak things for your liking and thanks for trying the Nanaimo Bars as well! 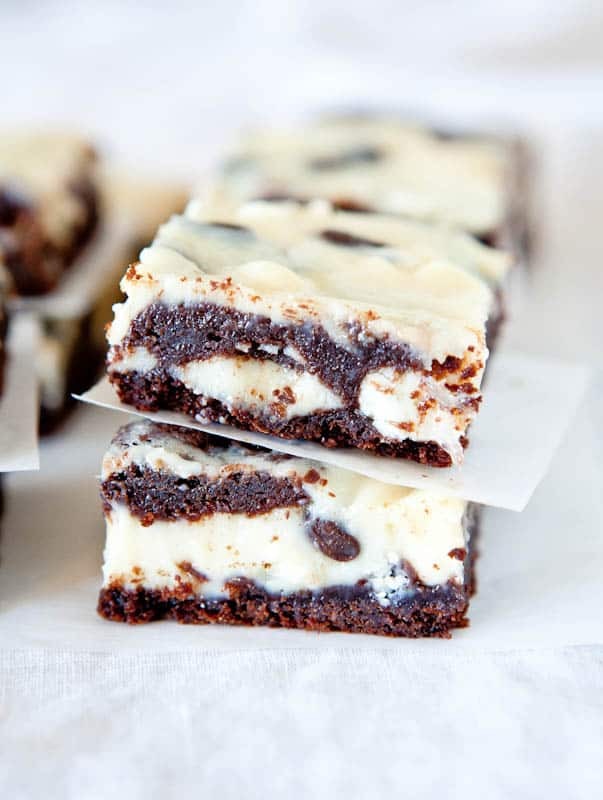 The Nanaimo Bar recipe I use is the official recipe from the City of Nanaimo website. In my opinion, Nanaimo bars aren’t Nanaimo bars made any other way. Easy for me to say, I’m Canadian and have access to Bird’s Eye Custard powder and it really has to be Bird’s Eye. I once ran out and used vanilla instant pudding instead and I’ll never do that again.